A few days after Christmas, my daughter put a leftover cinnamon roll in the microwave, set the timer for four minutes, and walked away. A few minutes later, as the cinnamon roll began to char, I hurried down the stairs after smelling smoke, and was shocked to see grey smoke billowing from the microwave. My son started coughing and crying in the next room. My husband rushed the noxious plate outside, and on a frigid 30 degree day, we opened all the windows in the house to let the smoke dissipate. My daughter was immediately a hysterical mixture of fear and shame. She's particularly afraid of our house burning down, and now she was the one whose mistake had filled it with smoke! Part of me wanted to chastise her in that moment, out of anger and fear, but part of me knew it could easily have been me who made the mistake. 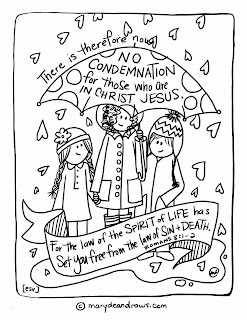 My daughter didn't need condemnation (or even instruction) in that moment; she needed kindness. That parenting moment got me thinking about how God parents us. When we sin, out of ignorance, willfulness, weakness, or immaturity, how does God respond in order to help us grow into wisdom, submission to his will, strength, and maturity? Is His strategy condemnation or kindness? Is he constantly frustrated by our humanness? The Scriptures paint a picture of a God who pities us. Jesus looks at us and says, "Father, forgive." He remembers that we are dust, that we want to do good, but that our flesh is weak. Pitiful and weak as we are, God doesn't love us begrudgingly; He says that He delights to show us mercy. He draws us to Himself with kindness and compassion, not condemnation. Yes, he certainly convicts of sin (for our healing), but he leads with kindness. This is important because what I believe about the heart of God towards me is directly connected to the way I deal with other people. So here's what I'm concluding: Condemnation is not a personal growth strategy. God doesn't use it. It doesn't work when I use it on myself. It doesn't work when I use it on other people. I have often believed that if I am hard enough on myself and feel bad enough for my sins, that I will change. I have often believed that if I express myself convincingly enough to someone else in their sin, make someone feel bad enough, that person will change. What does work, then? Kindness, compassion, mercy, pity. These all reach out and say, "Even though you are weak and flawed, I want to be in relationship with you, and so does God." 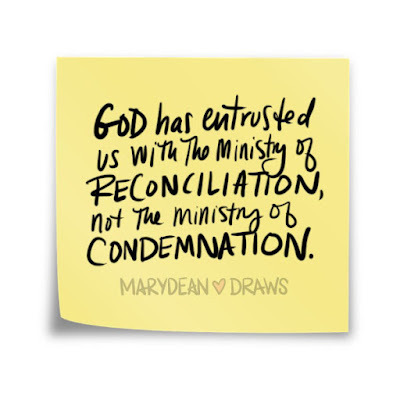 God has entrusted us with the ministry of reconciliation, not the ministry of condemnation. Yes, there is a place for godly rebuke and correction (see Galatians 6:1). Yes, let's live wisely and not let people abuse us. And yes, even if I offer kindness and compassion, it may not mean personal growth for anyone but myself--because kindness is not controlling. 1. You can look at the offender and think: How could you do ____? You are such a ____ (insult)? You don't deserve ____ (my love, God's love, affection, relationship, etc). 2. Or, you can look at the offender and think something like this: You don't know what you're doing, and likely this isn't what you want to be doing. Your flesh is weak. I know this because I'm the same. Because God has shown me unlimited and unmerited mercy, I'm going to delight to show you mercy too and not deal with you according to what you deserve. If I dealt with you according to what you deserve, I'd only be asking for what I deserve--and I certainly don't want that. This way of the God's kingdom isn't natural for me at all yet, but it's opening up a fresh space in my heart where I can breathe in the sweet (smoke-free!) air of God's kingdom. 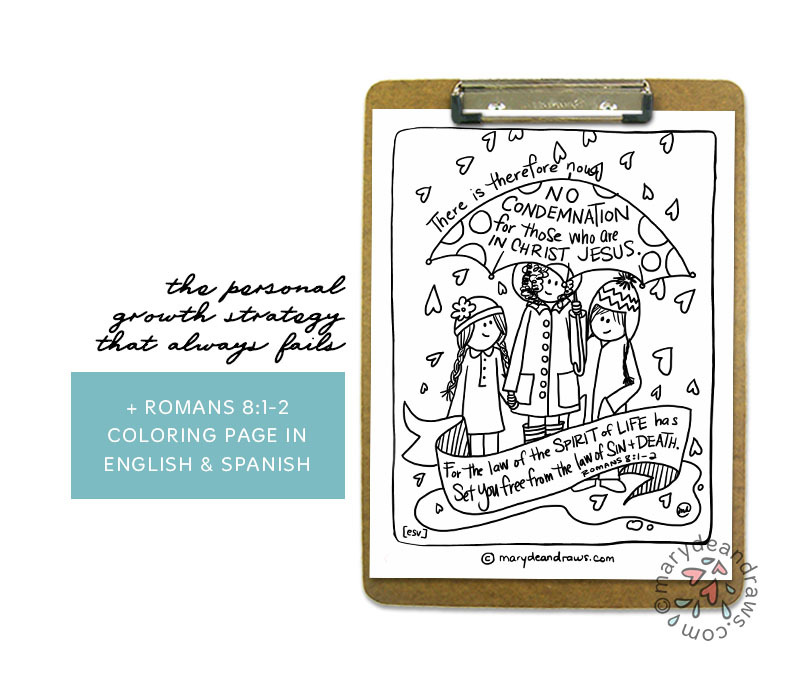 Today's printable Bible verse coloring page is from Romans 8:1-2. You can download the printable coloring page in Spanish HERE and in English HERE or by clicking on the images below. Would you do me a favor? 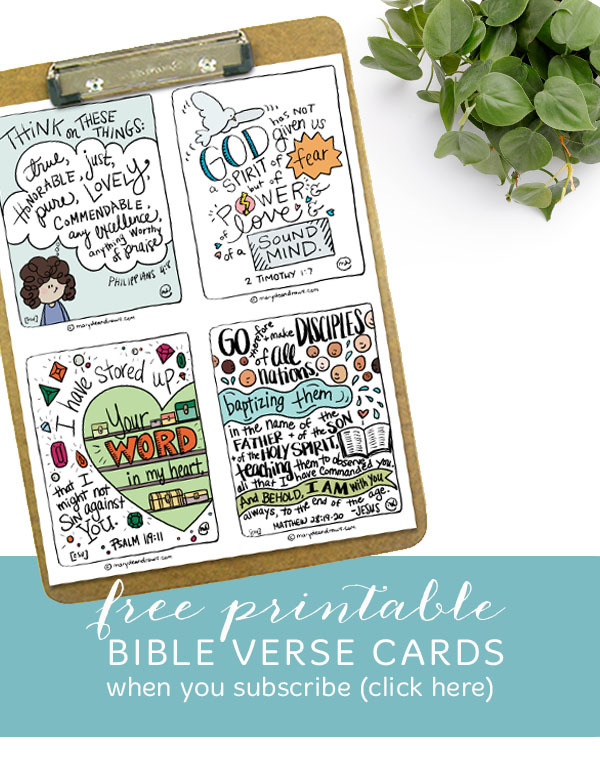 If you found this encouraging or helpful, would you share it with some friends who might be encouraged in God's love for them today? I pray that I would first know what it means to be loved by you and fathered by you. Then help me live in that reality as I relate to the people in my life. 1. Are you surprised by what the Scriptures listed above have to say about how God thinks and feels about you? 2. In what ways have you tried to use condemnation as a growth strategy for yourself? 3. In what ways have you tried to use condemnation as a growth strategy for someone else? 4. What would it look like for you to deal with people as God has dealt with you? *I'm so happy for you to enjoy my coloring pages and printables for your personal (not commercial) use! Use for Bible studies, church groups or events, and Sunday school classes are all fine! If you're in doubt, I'm happy to answer any questions. 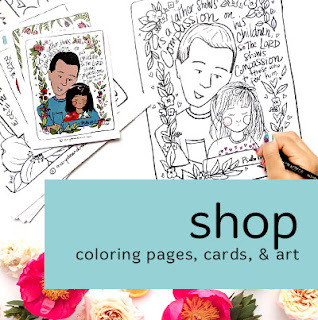 All artwork and photos are copyright Marydean Draws. If you share this, thank you (! ), and as a courtesy, please link back to this post and not the PDF file. 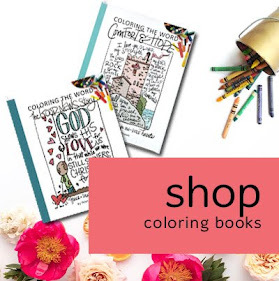 **affiliate link. We are a participant in the Amazon Services LLC Associates Program, an affiliate advertising program designed to provide a means for us to earn fees by linking to Amazon.com and affiliated sites. If you like this, you can get these posts in your inbox by signing up HERE! Loved this article. We all make mistakes and we all want to forgiven and accepted in spite of them. When my middle son was in his teens he put some eggs on to boil and then promptly left the house. When he returned, the house was full of smoke and the pan on the stove was a blackened mess. He took the pan to the yard and left it on the lawn where it was sitting when I got home. I wanted to be upset with him, but he looked so pitiful. He looked at me and asked, "but, Mom, where did the eggs go?" How could you stay angry when you are confronted with such a silly question? It was all good in the end.